Estonia is a North European country situated in the Baltic region. Estonian, closely related to Finnish, is the dominant language and the largest cities of the country are Tallinn, Tartu, Narva, Kohtla Järve and Pärnu. Estonia is culturally unique and during your visit you will encounter a contrast between the old medieval buildings and the modern colourful urban landscapes. The stunning Baltic coastline, rugged landscapes, many historic sights and the modern urban features make up Estonia’s eclectic mix of attractions that many tourists enjoy each year. Estonia’s location in the Baltic Sea makes this an ideal destination for those arriving by ferry. The major Estonian ports are Tallinn and Paldiski with crossings offered from Finland, Sweden, the Aland Islands and Russia. The shortest and most popular ferry crossing is from Helsinki in Finland, sailing across the Gulf of Finland to Tallinn. With more than ten sailings a day and crossings operated by multiple ferry companies, you can travel from capital city to capital city in around 2 hours. In addition to crossings from Finland, Tallinn is also reachable from Stockholm, St Petersburg and Mariehamn (Aland). Ferries also depart the Swedish port of Kapellskar and sail to Paldiski with DFDS Seaways. This is a faster alternative to the Stockholm Tallinn ferry service. With its location in the Baltic Sea, it is also possible to travel to neighbouring Latvia or Lithuania for additional options and travel on to Estonia from there. Ferry crossings to Estonia are operated by some of the most luxurious ferries available and feature facilities that you’d expect to find on a cruise ship so getting there should be a pleasurable experience. "I feel like on a cruise holiday! " I was surprised about this ship! Easy check in and out. Clean terminals and most of all the ship. The moment I enter brings back the memories when I was on cruise holiday. I like everything about this ship. Modern facilities and interiors with amenities that will keep you busy the whole trip. It add up to my holiday experience. I scored low to staff competence because one thing I noticed they do not smile much and greet passengers. I am a firm believer if they do it, it makes such difference to your experience!!! 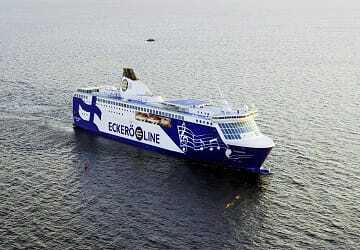 For more information, please visit our Ferries from Sweden to Estonia page. For more information, please visit our Ferries from Finland to Estonia page. For more information, please visit our Ferries from Aland to Estonia page. For more information, please visit our Ferries from Russia to Estonia page.